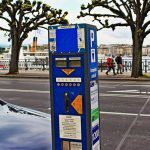 According to Tribune de Genève, one unlucky Swiss resident was fined in Gaillard in neighbouring France for using the wrong parking disk. They were fined 17 euros, despite not overstaying. Swiss rules require drivers to set their arrival time to the nearest half hour after their arrival. Someone arriving at 8:36 should set their disk at 9:00. Swiss parking rules are covered by Article 48 of the highway rules. Disks must have half hour increments, and look like the image below. The problem is, French disks have ten minute increments, like the one shown in the following photograph. Half hour increments are more generous to drivers. If you arrive at 8:36, then on a Swiss disk, your time starts at 9:00. On a French disk your time would start at 8:40. Setting the start time to 9:00 in this instance, breaks French rules. While the Tribune de Genève suggests the French disk is standard across european countries beyond Switzerland, a quick online search in German and Italian suggests their disks are the same as the Swiss ones, French disks being the odd one out. The hapless driver found the 17 euro ticket under the windscreen wiper. The car was parked only 100m from the Swiss border. It’s not clear what should befall those who use French disks in Switzerland. You could hardly fine someone for being more precise could you? Surely that would just be splitting hairs.